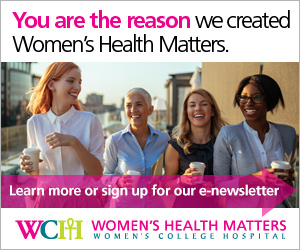 Women's Health Matters - Sizing up portions: what’s on your plate? Feature Articles » Sizing up portions: what’s on your plate? With terms like supersize and venti quickly becoming part of everyday language, it’s easy to lose perspective on how much we are eating and drinking. Compare a 20-ounce large coffee from Tim Hortons – or the 24-ounce extra-large – with a cup from any antique dish set. It’s clear that our idea of a cup of coffee has changed over time. The same is true of other foods: portions that would have once been considered large are now the norm. There is an important difference between a portion and a serving – and there is often quite a gap between the two. “A serving is a recommendation,” says Christo. Servings are what Canada’s Food Guide uses to recommend appropriate amounts of different foods for people of different ages and genders. The Food Guide shows how much of each type of food constitutes a serving, and how many servings from each food group people need daily. For example, a serving of milk is one cup (250 millilitres), and a serving of fruit juice is half a cup (125 millilitres). A portion is what we choose to eat, or what we’re served. “Unfortunately, they are often much bigger than recommended food guide servings,” Christo says. For example, a portion of pasta served in a restaurant might be two to three cups, which is actually four to six Food Guide servings. The guide recommends that women get six or seven servings of grain products per day, so that bowl of pasta might be a full day’s recommended grain intake. The problem with large portions is that they can result in people eating more than their bodies need, Christo says, explaining that the recommended number of servings from the four food groups is based on gender, age and activity level. Consuming excess calories can lead to weight gain, and being overweight is linked to a variety of health issues and risks of chronic conditions such as heart disease and diabetes. “You can choose healthy foods but still gain weight if you are eating more than recommended,” Christo says. Nuts such as almonds and walnuts are good examples: they are frequently touted as “superfoods” because they’re packed with nutrients, antioxidants and phytochemicals, but they are also high in calories. The Canada Food Guide serving size for nuts is a quarter cup (60 millitres) – the equivalent of a small handful. Reaching for a second or third handful means you’re eating two or three servings, at about 200 calories per serving. Servings and portions can become confusing when looking at food labels, which give information about calories, fat, sodium and nutrients. This is simpler for some foods than others. For example, a slice of bread is one serving of grains, so two slices of toast is two servings. Other foods are more difficult to judge in terms of Food Guide servings, especially when we’ve been pouring the same bowl of cereal or glass of milk for years. One way to approach portions is to find out just how much is in that bowl or glass. Once you understand your typical portion sizes, you can better calculate how many Food Guide servings you are eating. For example, after you serve yourself a plate of pasta, put that pasta into a measuring cup. If it’s one cup (250 millilitres), then you know that your usual pasta portion is two half-cup (125 millilitre) Food Guide servings. You can then use that as a guide in the future. Choosing healthy foods is vital. But eating those foods within the Canada Food Guide serving recommendations for your age, gender and activity level is essential for achieving and maintaining a healthy body weight, which is key to reducing the risk of many chronic diseases, Christo explains. “People often know what to eat, but healthy portion sizes are just as important,” she says.